Regeneration – follow up post | Curly's Corner Shop, the blog! 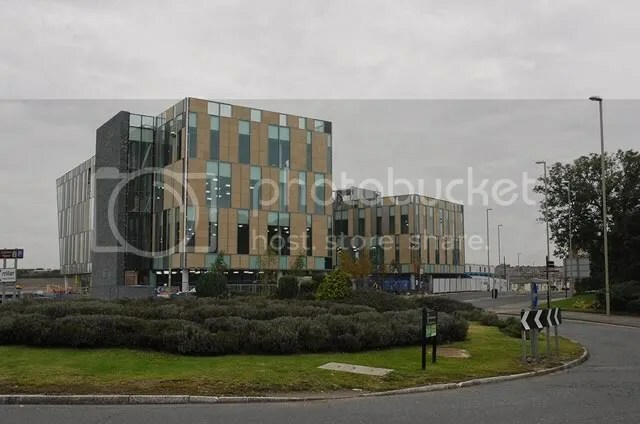 In my last post a Mr. MiCawber asked if it was possible to get pictures that compare the new BT South Tyneside HQ on Harton Staithes, South Shields with the artist’s impression published about four years ago at the time that proposals and consultations were getting underway. Another commenter asked if we could have some involvement from youngsters who would then feel more empowered about their own futures and how they can help shape South Shields. Well, a bit of good news on both fronts for you in a moment. First of all, thanks to some readers, we have tracked down these pictures which you see today, the picture above shows the new BT building as it nears completion and below you can see the artist’s impression before the building project began, in this impression the BT building sits in a new Riverside Park designed to link the River Tyne with the Market Place and town centre, whilst providing the opportunities for people to enjoy walking by the river in a pleasant environment which provides the views to which they have become accustomed over the last few years. One does NOT have to stretch the imagination too far to realise that this BT building is not going to be a blot on the landscape as suggested by many of the respondents to The Shields Gazette! Just before the summer holidays began BT wrote to every head teacher in South Tyneside inviting their pupils to take part in an art competition to mark the opening of the new BT Building, the theme for the students to follow is what they think the riverside area will eventually look like after the regeneration and rebuilding processes are complete, this is future stakeholding at work tying in the imagination of youngsters and encouraging them to take a view of the future look of their town, it is to be applauded. Winners will see their work framed and mounted inside this new business centre and be taken on a tour of the building at the official opening event, their will also be cash prizes for the winning schools. I seem to recall that this was one of the first suggestions that I made to development officers at the first of their road shows in 2007, a good point here being that it is both important and rewarding to take some part in the consultation process rather than ignoring it. This is a major redevelopment in South Shields and covers a huge area of riverside frontage from the Market area all the way along to the old Readhead’s shipyard (Aker McNulty as it is now) and so far there has been NO political objections in principle to the proposals and designs so far formulated, it would be an almighty shame now for some local councillors to start bawling and shouting now that the first major building is almost completed, they have had ample opportunity to make their views heard over the last four years, and if they had nothing to contribute over that period then it shows they were incapable of even looking at the horizon, let alone past it!`As for the respondents to articles in The Shields Gazette recently, they must be blinkered and completely ignorant of the plans that have slowly developed over recent years, and clearly they have NOT taken any interest in how those plans were arrived at, it worries me greatly that their pretty silly objections may gain some sort of credence through a wider online readership, I do NOT feel that they are representative of the majority of residents in South Shields or South Tyneside who, I believe, will come to like the new more modern ambience that our riverside will provide in due course. 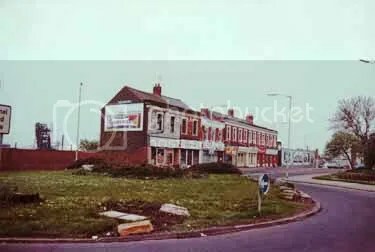 Surely when it comes to riverside views they do not want to go back to the good old days of this? The picture at the bottom was the view that, all of those complaining about the ‘BT eyesore’, had for years. problem is, they’ve been spoiled by a few years of unrestricted views across the river. They could’ve built the hanging gardens of Babylon and there would still be people moaning. Whilst it’s sad that the river’s shipbuilding and mining heritage is over, unfortunately that’s just the way it is. We should embrace the modernisation of the river front which will only encourage more visitors to the town. With a newly redeveloped market place too, it could resuscitate the whole town centre area. Age old problem with artists impressions; there is no way that the public would see the particular view unless on a passing low flying plane ! While the building in reality looks very much as the impression its dominance from ground level is what most people will see; only time will tell if the adjacent associated developments will help it to blend in more sympathetically. Thanks Curly. I too cannot see what all the song and dance is about. I think the picture of what we used to have, puts it all into perspective. I only hope that the landscaping will not be too far behind. On another front, I was walking past the Waterloo Vale development today and discussing it with a friend. Wouldn’t it have been lovely if somehow or other , it had been possible to site these shops in Ocean Road between Minchellas and Kirkpatricks and on the other side in the old Woods building? This would have enhanced Ocean Road and prevented the opening of yet another Curry House and at the same time keeping BHS etc. within the main shopping area.